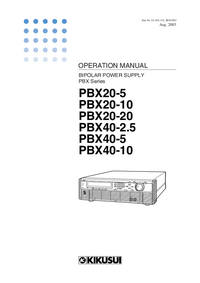 The PBX Series Bipolar Power Supplies are regulated power supplies of a bipolar-type, featured by performance reliability and safety. They employ a power Amplifier system, thereby rendering advantageous features such as low ripple noise, high stability, and rapid response. Being a 4-mode type, they serve also as a source or a sink of power, or as a booster of a function Generator. They are microprocessor-based instruments and provide advanced functions and ease of operation. Each of them can operate either in a constant-voltage mode (C. V mode) or in a constant-current mode (C.C mode), mutually independently. This allows you to use them also as a constant-current source or as a volt-age-controlled current source. You may remote-controlled them via an optional GPIB, RS-232C, or MCB(Multi-channel Bus) interface, thereby making them applicable to various purposes. Typical applications are for research systems in laboratories and for automatic production and inspection lines in manufacturing plants. This Operation manual is composed of seven chapters and appendices as follows: Chapter 1. GENERAL Introduces an outline and features of the Power supply. Chapter 2. PRECAUTIONS AND PREPARATIVE PROCEDURES Describes the procedures for installation, AC input power cable connection, power-on test, operation mode selection, and load connection. Chapter 3. OPERATING METHOD The former half of this chapter introduces the names and functions of keys, indicators and other panel items, and describes the basic operation method of the power supply; the latter half describes procedures for sequence operation and applied types of operation. Chapter 4. REMOTE PROGRAMMING Describes the procedures to remote-control the Power supply via an Interface board (optional) from an external controller. Chapter 5. 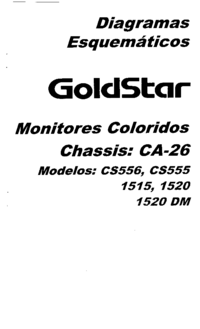 PANEL DESCRIPTION Introduces the names of and describes the functions of the switches and other items of the front and rear panels. Chapter 6. MAINTENANCE AND CALIBRATION Describes the maintenance, inspection, and calibration methods. Chapter 7. 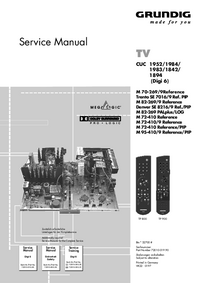 SPECIFICATIONS Gives tables of electrical specifications, mechanical specifications, accessories, and optional items. APPENDICES Provides an error message table, a troubleshooting chart, a table of factory-de-faults, a menu configuration chart, sequence coding sheets, and a table of ID codes for calibration.